The journey to success began in 1904, in the hands of founder John Parker. Born and bred in Whitehaven, the devoted churchgoer decided to move to Canterbury. He thought the Cathedral City to be the best place to start a new life. Having previously worked as an ironmonger Mr Parker opened his very own shop at No. 11 The Parade, selling tools and goods to the trade. Soon enough, he realised the potential to diversify into stockholding iron, to cater for the local farming community. He acquired a small yard in Watling Street, and began stockholding the first batches of metal for local trade. The first stage of Parker expansion had begun. In 1923, John's second son Jack accompanied his father in running the business. When war broke out in 1939, Jack decided to join the RAF and served for the duration of the war. The company stood unwavered and strong throughout the time of hardship, but sustaining trade eventually took its toll on John. When Jack returned from the RAF, Parkers was ready and waiting for him. John hung up his tools and handed over the keys to the next generation. He lived for a further 20 years until his death in 1966. Post-War construction and shortage of steel in 1950 meant business hit overdrive. Parkers embraced this, providing plentiful supply. The next in line, David (Jack's son) joined the company, helping his father to manage the increasing workload. Keeping up with demand, major expansion plans were brought into action. In 1960 the company located to a larger site in Rhodaus Town. In order to keep pace with the company's growth Parkers moved again in 1970 to our current location in Vauxhall Road, a world away from the humble beginnings at The Parade. Parkers continued to grow from strength to strength. When previous economic fortune gave way to recession in the 1980's, the company took a stand. Not to be beaten by the downturn, Parkers diversified, refusing to stay static. In 1980, the Andover depot opened for business followed by the Waterbeach branch in 1989. The expansion projects aimed to target potential buyers further afield and enabled the company to offer next day delivery which became our trademark service. The decision to expand not only made people aware of the Parker brand, it also catapulted the business into a major stockholding force in the UK. Investment has always played a key role in Parkers development. The £1 million spent in 1998 revolutionised the way in which the company operated. "Big Betsy", the mighty shotblasting machine was put into action, capable of shotblasting and priming 2.5m of steel in 60 seconds, ready to load and dispatch for next day delivery. Betsy led the way as an array of high quality processing machinery followed. The Waterjet machine, installed in 2006 cuts metal with a 60,000 psi waterjet, enabling the smoothest finish. The tube laser, introduced in 2008 is fast, precise and can process tube up to 6mm thick. On the same site Parkers also has over 40 machines including lasers, drill lines, plasma cutters, profile machines and an 8 mtr brake press. No other competitor can match our vast range of services. In 2002, Parker and Son acquired another family steel company, Yeowart Steel Stockholders in Gatwick. But it didn't stop there, in 2004, Parkers took over CBA Metals who were a bright steel stockholder based in West Sussex. The ability to branch out enabled Parkers to combine the knowledge and expertise from both businesses, propelling the company forward into the future. Even when the longest recession in British history hit in us in recent years, the company believed that expansion and development would reach out to a broader market. 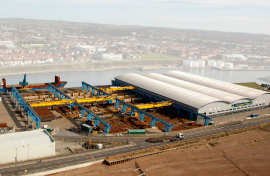 Our most recent depot in Shoreham opened in 2008 and was completed in April 2012 with the capacity to unload 5,000 tonne ships of bulk steel straight onto our steel stockyard ready for processing or immediate dispatch to our customers. This operation aims to provide better coverage throughout the UK, offering a wider range of stockholding and processing services to all customers. Our processing plant is the most technologically advanced of any stockholder in Europe. Comprising of 2 huge shotblasters, 4 saw & drill lines plus 2 cope & drill lines we have over 50% of the structural steel drilling capacity in the UK. Despite fluctuations in the economy Parkers powers through, always developing and broadening its service. For those who think we are just a stockholder, they would be wrong! The ParkerTools division of John Parker & Son has been supplying tools & consumables to trade & DIY users for generations. Our on site shop and engineering warehouse stocks over 10,000 products, all available for next day delivery across the UK. We believe in constantly expanding our product range to keep up with industry demands and customer requirements. These industry demands have now led ParkerTools to becoming one of the largest suppliers of CE approved fixings & fasteners in the UK, making us the no.1 choice of suppliers of many UK businesses. Parkers is still growing, still delivering a quality professional service throughout the country, still keeping our customer's interests as our top priority. The company is still family run, as Guy, great-grandson of founder John Parker is the Managing Director. "The massive increase in the use of technology and the number of people employed. When I started, the company employed just 12 people and my father did the wages by hand!" At present, around 500 people are employed across all our sites. With over 500,000 square feet of warehousing, we now continuously stock over 40,000 tons of structural, general, non ferrous and engineering steels. Our processing facilities have grown significantly with over 30 state of the art machines across our sites. This dramatic increase in storage, stock range and processing facilities has now made Parkers the largest steel stockholder and processor in the UK. It is not only our products and services that have grown, Parkers delivery fleet is now an impressive 60 strong fleet of purpose built vehicles and arctic trailers, travelling over 30,000Km everyday to England and Wales. This is certainly a big change from the horse and cart originally used by John Parker to make local deliveries across the city. Parkers are continuously diversifying, expanding, developing and improving our services to meet the needs and expectations of all our valued customers. This is the John Parker & Son commitment! Click here to visit the John Parker & Son Limited Corporate site.